The board helps identify the impact that emerging market trends, practices and services might have on consumers. Acting Director of the Consumer Financial Protection Bureau Mick Mulvaney reportedly fired all 25 members of the Bureau's Consumer Advisory Board on Wednesday. The board helps identify the impact that emerging market trends, practices and services might have on consumers, including problems facing Americans treated unfairly by firms. Critics are concerned that Mulvaney has been weakening the CFPB from within. Mulvaney became acting director last year. While in Congress, he was critical of the watchdog group. On Monday, 11 members of the panel criticized Mulvaney for canceling the only two meetings the board had planned for the year and said the bureau was moving away from helping everyday Americans. The CFPB will reportedly reform the group in the fall with all new members. 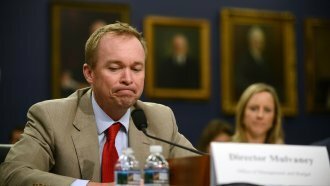 The Washington Post reports the members Mulvaney fired were told they could not reapply for the board.